Heat the oven to 400°F. Grate 1 1/2 teaspoons zest and squeeze 1/2 teaspoon juice from the lime. Unfold the pastry sheet on a lightly floured surface. Roll the pastry sheet to remove the fold marks. Using a round cutter, cut the pastry sheet into 6 (3-inch) circles. Place the pastry circles onto a baking sheet and refrigerate. Heat the butter in a 1-quart saucepan over medium heat. Add the brown sugar and lime juice and cook until the mixture boils and thickens, stirring often. Add the mango and stir to coat. Remove the saucepan from the heat. 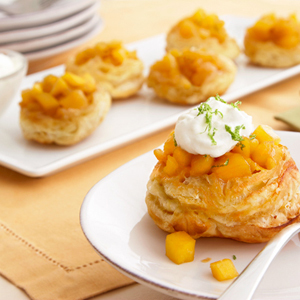 Divide the mango mixture among 6 (2 1/2-inch) muffin-pan cups. Top each with 1 pastry circle, lightly tucking the edges around the filling. Bake for 15 minutes or until the pastries are golden brown. Let the pastries stand in the pan for 1 minute. Place a baking sheet on the pan. Invert the pastries onto the baking sheet. 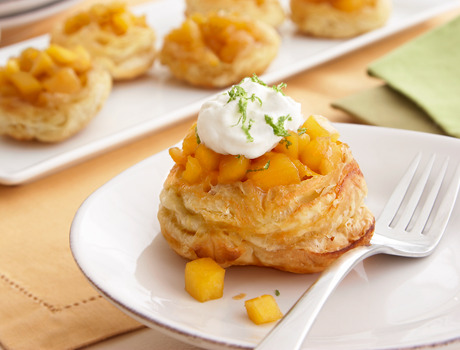 Top with the whipped cream and sprinkle with the lime zest.